Looking for some good news as Tax Day approaches? While settling up you tax bill is not generally all that fun, some restaurants and businesses are stepping up to help take the sting out of the day with freebies, deals and discounts aimed at the beleaguered tax payer and anyone else who is looking for some swag. Below is a list of freebies and deals for Tax Day and a reminder of when your tax bill is due. Note: Some of the deals below will not be offered at every location, not every franchise honors the deals. Call ahead to your local restaurant to make sure they are honoring the offer. When is tax day 2019? This year, Tax Day, or the day by which tax returns must be sent to the Internal Revenue Service, is April 15, which is Monday. Most taxpayers must file their returns by midnight Monday unless they have filed for an extension or live in Massachusetts or Maine. Because of the Patriots’ Day holiday in both of those states and the Emancipation Day holiday in Washington D.C. on Tuesday, residents of those states get an extra two days to file. Patriots’ Day commemorates the first battles of the Revolutionary War – the Battles of Lexington and Concord, fought on April 19, 1775. Emancipation Day marks the day the Compensated Emancipation Act was signed by President Abraham Lincoln. The act signaled the end of slavery in the city of Washington. What kind of freebies and deals are available for Tax Day? Amazon Restaurants: Get $7 off an Amazon Restaurants order in select cities. Use the code EAT7. Applebee’s: Applebee’s has an April drink special, the Strawberry Dollarita with a Twizzler straw, for $1. Bananas Smoothies & Frozen Yogurt: You can get a free small frozen yogurt on Monday. BJ’s Restaurant & Brewhouse: You can get half off the price of a large deep dish or Tavern-Cut pizza Monday for dine-in, take-out or delivery. Boston Market: Get the Tax Day meal special for $10.40. The deal includes a half chicken individual meal with two sides, cornbread and a regular fountain drink, while supplies last. It is available through Monday at restaurants and for online delivery. Bruegger’s Bagels: Get 13 bagels and two tubs of cream cheeses, for $10.40 through Monday at participating bakeries. You must be a member of the Bruegger’s Inner Circle or claim the offer at www.brueggers.com. BurgerFi: Get a $4.15 BurgerFi Cheeseburger on Monday through the BurgerFi app only. Go to www.burgerfi.com/rewards to download the app. California Tortilla: Say “1040” to your waitress on Monday and get free chips and queso with any purchase. Cicis: Adult buffets are $4.15 on Monday with the purchase of a large drink. You must use this coupon. Corner Bakery Cafe: Get two entrees for $10.40 Monday through Wednesday in-café only. Farmer Boys: You do not need a coupon to get two Breakfast Burritos or two Double Big Cheeses for $10.40 on Monday at participating locations. 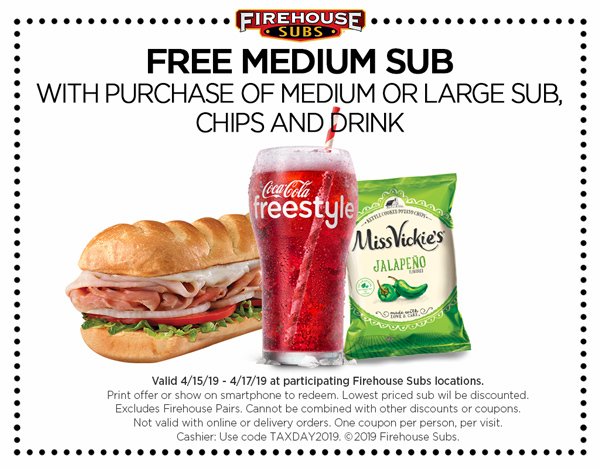 Firehouse Subs: Get a free medium sub with purchase of a full-price medium or large sub, chips and a drink Monday through Wednesday at participating locations. Use this coupon. It can be shown on a phone or printed out. Great American Cookies: Get one free Original Chocolate Chip Cookie at participating locations. Hardee’s: Get a free sausage biscuits from 7 a.m.-10 a.m. Monday at participating locations. Say, “Made from scratch” to get the biscuit. Only one per customer while supplies last. Kona Ice: Stop by a Kona Ice truck during select hours Monday for a free cup of tropical shaved ice. Click here to find participating hours and locations. Menchie’s: Get a free frozen yogurt by downloading the Menchie’s app by Monday. Office Depot/OfficeMax: Through April 27, you can shred up to five pounds of documents for free with this coupon. Pizza Hut: Through Monday, you can get any large two-topping pizza for $5.99. It must be ordered along with online carryout orders. Planet Fitness: From Thursday through April 20, you can use available HydroMassage chairs with a coupon that will be available at www.planetfitness.com on Thursday. Potbelly Sandwich Shop: Mention “Tax Day” and get a buy one, get one free sandwich at participating locations. To redeem, Perks members can use their Potbelly Perks account and non-Perks members can tell the cashier it is Tax Day when at check out. Schlotzsky's: On Monday you can get a free small original sandwich with purchase of chips and a medium drink Tax Day. Sonny’s BBQ: You can get the IRS – Irresistible Ribs Special – deal Monday with half-priced Sweet & Smokey or House Dry-Rubbed Rib dinners. You get two sides and bread with the deal. TooJay’s Deli: Get a burger and beverage combo for $10.40 at any of TooJay’s 28 locations across Florida with this coupon on Monday. Waitr and Bite Squad: Use the promo code TAXDAY19 on Monday and get “no delivery fees” when you spend $20 or more on food.